HERE ARE TWO STORIES in the Gospel of Luke that are closely related. They both have the same characters: Jesus, and the Apostles Peter, James, & John. They both take place at decisive moments in our Lord’s life. In both stories, Jesus is praying, while Peter, James, & John fall asleep. Both scenes take place on mountains—one on Mount Tabor, and the other on the Mount of Olives. And both of these stories are passages we encounter in the Lectionary during Lent. What are these stories? 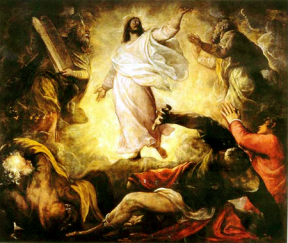 The first is the Gospel for the 2nd Sunday of Lent: the Transfiguration of our Lord. Jesus takes His closest three friends up a high mountain to pray. True to form, they fall asleep! When they wake up, Saint Luke tells us that “they saw His glory” (Luke 9:32). Our Lord’s face “changed in appearance and His clothing became dazzling white” (Luke 9:29). Then they hear a voice from the cloud, saying, “This is my chosen Son; listen to Him” (Luke 9:35). 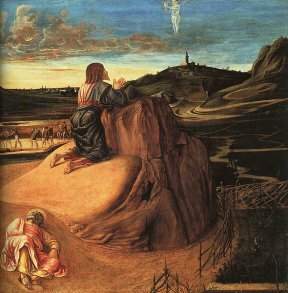 The second, very similar story, is the First Sorrowful Mystery: the Agony in the Garden. The scene takes place on Holy Thursday evening, immediately after the Last Supper. Fearful for the suffering He knows He must undergo, our Lord goes to the Garden of Gethsemane to pray. He again takes Peter, James, & John with Him, but they cannot stay awake. Luke writes that “He was in such agony and He prayed so fervently that His sweat became like drops of blood falling on the ground” (Luke 22:44). These two scenes are similar in so many details, and I propose that their ultimate meaning is also the same. What is the shared meaning of these events? Both on Mount Tabor and on the Mount of Olives, Jesus gives us an example of One Who has given Himself up completely to the will of God. The Transfiguration could only happen because God the Father was revealing His glory through God the Son. Jesus, at that moment, is accepting His identity as the “chosen Son” of the Father. And, in the Agony in the Garden, the strength and peace of God are again being revealed by the Father through the Son. Jesus, in the garden, accepts the Passion He must undergo for the salvation of the world. It would be hard to underestimate the effect that the Transfiguration and the Agony in the Garden had on Peter, James, & John. They were the sole witnesses to both events, but those sacred moments changed the course of their lives. Having seen our Lord both in glory and in agony, those three men were empowered to give themselves up to the will of God. They spent their lives spreading the Gospel message throughout the world. Peter & James eventually gave even their lives for the Gospel. In doing God’s will, they became light for the world. These two scenes, which we encounter every Lent, provide the perfect message for our Lenten pilgrimage. When we give ourselves up to the will of God, we give testimony to the Gospel. When we give ourselves up to the will of God, we receive strength to endure our suffering. When we give ourselves up to the will of God, we, like Jesus, become radiant.